An Aladdin's Cave of Carnival Glass Tumblers! In the late 1990s, we had the privilege of seeing for ourselves Bob Smith’s astonishing collection of Carnival Glass tumblers. It was like entering Aladdin’s cave. Everywhere we looked there were tumblers - even in the windows, where custom built shelves turn the panes of light into a jewel-like, kaleidoscope of colour. Cobalt blue, golden marigold, emerald green, cranberry, smoke and delicious ice pastels - in as many shapes, sizes and patterns as you care to imagine. The pictures on this page of Bob's tumbler displays were all taken when he invited us to his apartment for a private viewing. It was a very special moment that we treasure. Bob's Carnival Glass tumblers turn his room into a dazzling display of light with a jewel-like kaleidoscope of colours. The fabulous Bob Smith Tumbler Collection features tumblers from all over the world. It represents all time frames of Carnival Glass production from Classic through Late Era to Contemporary tumblers. ​It belonged to a gentleman who was the world’s foremost Carnival tumbler 'collector/researcher’ - Bob Smith. ​The collection is his life’s work, and it was his often-expressed wish that his collection was to remain together as a unique reference collection, available for future generations for study and research. Bob explored how best to keep his collection together in this way, considering bequeathing it to the Smithsonian, or to Corning Glass Museum. However, he felt that the likely outcome would be that only a few items would be displayed, with the rest being sold off. That was an abomination to Bob – it was the complete opposite of what he told us he wanted. His desire was to keep the collection together, as a complete whole, as a legacy for future generations of Carnival. ​In 2011 he wrote to inform us that he could not think of another person or collector who would keep the collection together, saying to us “since I’m the last person alive in my family – that’s out – so you will get them.” We promised Bob we would take care of and preserve his legacy collection. Bob re-affirmed his bequest to us in July 2016, writing to us “you are the owner now” (of the Bob Smith Tumbler Collection). We were honoured and humbled by this. We committed to Bob that the collection would never be sold or broken up, and that we would share it online here with Carnival and glass collectors through The Bob Smith Carnival Tumbler Museum. ​Sadly, Bob passed away in November 2017, but he was comforted by the knowledge that he had entrusted the ownership and the guardianship of his unique collection to us, to preserve the legacy intact, for future generations of collectors and researchers. ​Before he died, we were able to make Bob’s Tumbler Museum a reality for him to see. He wrote to us about it, saying it is "Absolutely Beautiful. I don't have enough words to tell you how pleased and happy with what you have done. That must have taken some time. After you have it ready for everybody, you are going to have emails galore. For myself, I just can't come up with all of the wonderful words it deserves.” The Museum remains a “work in progress”, as heart-breakingly since Bob’s death, its further development has not been possible. Bob Smith's Passion - Carnival Glass Tumblers. ​Behind this fabulous collection is a story that tells of the dedication of Bob Smith. Tumblers were Bob’s passion, over many long years. But Bob wasn't content to leave it at simply collecting tumblers - Bob was determined to find out as much about them as possible. ​And to do so, he set off on a round-the-world trip that took him to locations as far apart as Europe, Australia and India. ​Bob’s experiences in India (and his subsequent research) ultimately changed Carnival Glass history the most; for Bob is responsible for uncovering the story of Carnival Glass production in India - and all Carnival collectors are now aware of what an astonishing array of fabulously exotic Carnival Glass has emerged from the country over the ensuing years. Bob's collection includes many of the finest and rarest Carnival Glass tumblers in existence, particularly Classic tumblers from the major Carnival Glass makers in the United States. Bob’s purchase of the legendary Frolicking Bears tumbler will be forever imprinted on his memory. There are also Millersburg rarities and many “one-of-a-kind” tumblers packed onto the shelves. Enamelled tumblers, Late tumblers (which Bob referred to as being from the “Lost Carnival Era” of the 1930s-1950s), Souvenir tumblers as well as some amazing tumblers from Europe and further afield. A lifetime of collecting and searching is reflected in the superb displays he had in his apartment. Many, many miles travelled, so many friends and memories gathered along the way. ​We have learned so much from Bob Smith. Wisdom, patience and determination are three of his many qualities, coupled with a witty sense of humour and the delightfully disarming trait of self-criticism. The Carnival Glass world has already learned much from him: his travels, his research and his observations, all contribute tremendously to our knowledge today. We also learned that money was not a motivator for Bob. He lived frugally, and he was totally committed to educating and informing the Carnival Glass world. Money was simply a way of achieving this heartfelt ambition. When he was ill and when he could have sold his Tumbler Collection to fund his care, he chose instead to bequeath it to us, confident in the knowledge that we had promised to preserve and protect it as a comprehensive legacy for future generations of collectors and researchers. Well, they’re compact and they display beautifully featuring a kaleidoscope of colour and pattern; they are representative of many Carnival makers worldwide and they span over a century of Carnival Glass production. ​Many of them also belong to a wider pattern range, such as Northwood’s Acorn Burrs, Grape and Cable and Singing Birds and Riihimaki’s Starburst – thus one tumbler can betoken the wider range. Many tumblers were originally part of a full water set - a pitcher and six tumblers. Sometimes a tumbler will be part of a tumble-up (itself often part of a dresser set), while just a few tumblers were stand-alone, and no matching pitcher has yet been found (such as the rare Garderstern from Brockwitz). 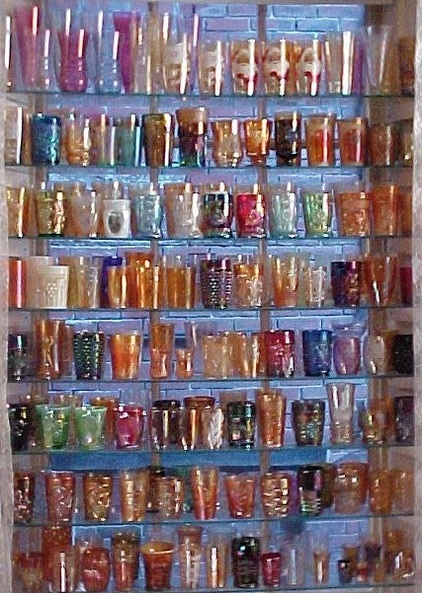 ​​Bob Smith's Carnival Glass Tumbler Museum on Carnival Glass Worldwide. The Museum has Three Wings where Bob's collection is displayed: The Classic / Vintage Tumbler Wing, The Depression Era and Late Tumbler Wing, and The Contemporary USA Tumbler Wing. Within the Wings, the exhibits will be seen in dedicated Rooms, as either featured items (with enhanced information), or picture galleries. Many of the tumbler images are Bob’s photos of his glass: some of these will be added to over time with higher resolution images. ​​To Enter the Museum click on the "Enter" icon on the left, and enjoy your visit!